Over the years I have been able to work with equipment the likes of which many people cannot even comprehend. I worked as a project engineer for J. Ray McDermott for seven years and gained experience in the arena of ultra heavy lifting. I planned the installation of offshore oil and gas drilling and production platforms overseeing all aspects of the project from loadout at the fabrication yard, seafastening design, transportation to the field and final installation of the jacket, piling and topside deck. What I hope to showcase here are photos I have taken over the years of projects I have planned. Most photos will show either the vessel performing the work (usually a crane ship or derrick barge) or the structure being lifted. Over the course of seven years I worked with lots of amazing equipment, the most amazing of which was definitely the behemoth 5000 ton lift capacity Shearleg Crane of the JRM fleet. This crane was actually a seperate item which was fitted onto the launch barge Oceanic 93. The entire package could be skidded onto the bank or onto another vessel. This piece of equipment was well suited to the shallow water environment of the slip adjacent to the JRM Fabrication yard in Morgan City, Louisiana. This photo shows the Shearleg lifting a 2800 ton production deck from the fabrication yard onto the cargo barge. The Shearleg, cargo barge with deck and a small fleet of jackup boats then mobilized to just off the coast of Mobile, Alabama to install the deck onto the jacket structure which we had installed earlier in the year. Once a production platform has been installed offshore in the Gulf, it needs some means of getting the produced oil and gas back to shore. This is done by a network of interconnected pipelines on the seafloor. 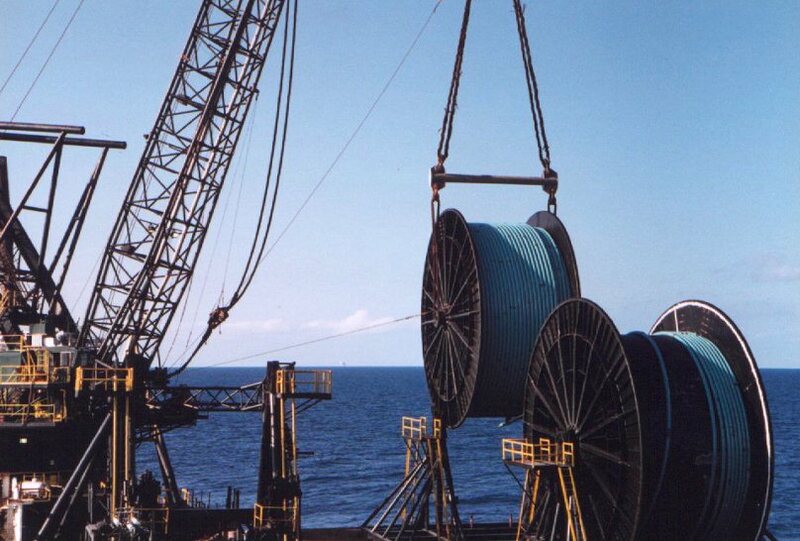 The concept of "reeling" pipe for installation gained popularity during the 70's. 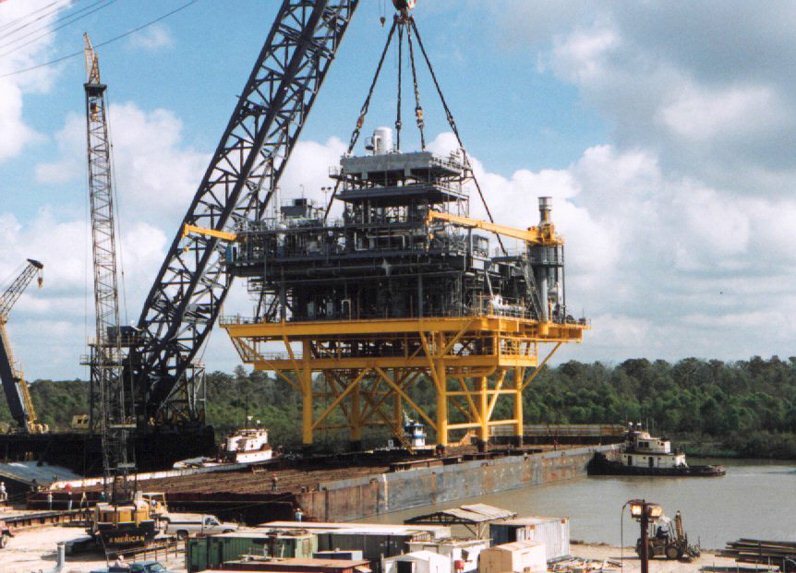 This photo shows the Derrick Barge #16 loading a 500 ton reel of 10" diameter pipe from the transport barge onto the base onboard the Derrick Barge. It will be reeled out in a continuous manner saving time over the conventional method of welding a single 40' joint of pipe at a time. The part of my job that I enjoyed the most has always been heavy lifting. I loved putting together the right slings and shackles from availible in house inventory to lift a structure level. When the right lift gear is not availible in house, however, the place to go is Versabar. This shop specializes in custom ultra heavy lift gear-slings, shackles and spreader bars. 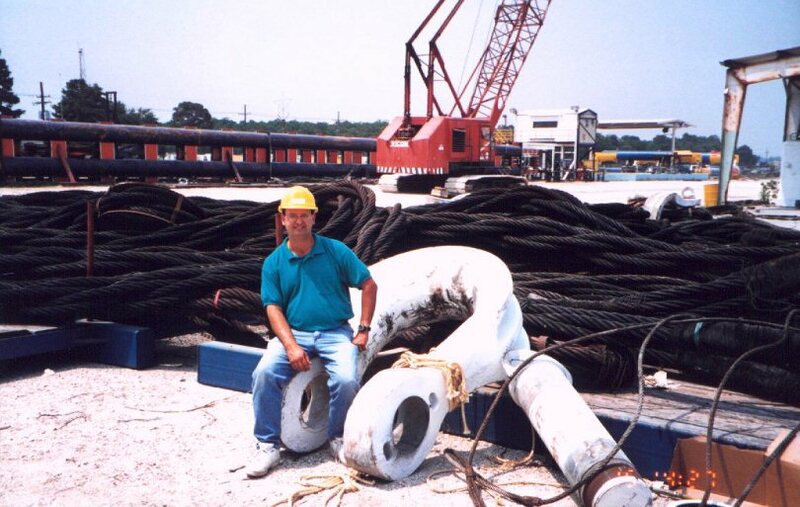 Here is a photo of me at their Belle Chase, Louisiana yard on a 1250 metric ton Crosby Wide Body shackle. Hats off to Jon Khachaturian and all the guys there for lots of great lifts!